The NALC embraced the Muscular Dystrophy Association as its “official charity” in 1952, becoming the first official national sponsor of the charity founded in 1950. The union’s first nationally coordinated campaign to raise funds for MDA came during Thanksgiving Week in 1953, when tens of thousands of letter carriers in more than 800 cities returned to their routes for a second time after completing their holiday-heavy mail deliveries. The all-volunteer effort was called “The Letter Carrier March for Muscular Dystrophy. “ Over the years, Branch 361 has held numerous fundraisers to benefit MDA. Current efforts focus on an annual golf scramble, “Super-Bowl a thon” and a monthly 50/50 raffle. MDA Fill-the-Satchel, Pounds Away for MDA, One Hour’s pay for MDA and a golf marathon are some of the additional events planned for 2016. Watch the news and calendar pages for dates and events. 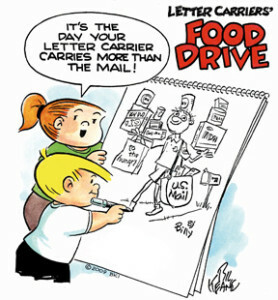 The NALC “Stamp Out Hunger” nationwide food drive is the largest one day food drive in the country. It takes place each year on the second Saturday in May. The 2016 food drive will be May 14th. Overall, the N.A.L.C. was able to provide critically needed goods to food distribution centers in every part of the nation. At last count, the official tally for the 2015 drive was up to 70.6 million pounds of food collected in more than 10,000 cities and towns in all 50 states as well as U.S. territories. This marks the tenth consecutive year where donations exceeded 70 million pounds nationally. The collection figure brought the 23-year total to more than 1.4 billion pounds. In some areas of the country, the success of this year’s drive often resulted from local distribution of special paper or plastic bags bearing the food drive’s logo. Many communities also donated food in record numbers because of citizens’ keen awareness of an immediate need to support those living in areas ravaged by recent tornadoes and floods. NALC president Fred Rolando highlighted the efforts of the nation’s letter carriers, their families and countless volunteers for their help in making the drive a success. He also thanked the NALC’s national partners in the drive, including the National Rural Letter Carriers’ Association, U.S. Postal Service, Campbell Soup Co., Valpak Direct Marketing Systems, United Way Worldwide and its local United Ways, AFL-CIO, Feeding America food bank network and Uncle Bob’s Self Storage. The United Food and Commercial Workers International Union (UFCW) has joined as a national partner for the 2016 drive. Rolando also noted with appreciation the boost provided by “Family Circus” cartoonists Bill and Jeff Keane, who annually provide special artwork to promote the drive.